The 2014 Chevrolet Corvette Stingray Coupe will arrive as the most power “base” Corvette or all time but GM didn’t stop at the 450 horsepower LT1 when they were focusing on the performance capabilities of the C7 – including a revamped braking system that features unique two piece brake rotors for the high performance Z51 package. 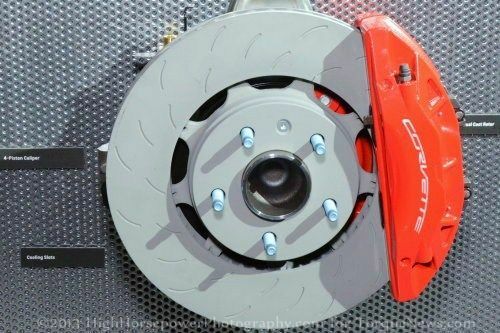 Two piece brake rotors are not unusual in the sports car segment but, like the carbon ceramic brake rotors on the 2013 Chevrolet Corvette ZR1, they are traditionally reserved for very high end cars. The reason for this is that they are constructed of high cost materials so in engineering the braking system for the 2014 Corvette Stingray, GM wanted to find a lightweight braking solution that wouldn’t break the bank. Luckily, GM didn’t have to look far. SANLUIS Rassini North America is an automotive supplier based out of Plymouth Michigan, handing breaking and suspension needs for a variety of automakers including Volkswagen, Ford and other projects with General Motors. Rassini’s engineering team designed the industry’s first two piece brake rotor using a ductile iron hat (the center section) and a gray iron braking plate. Rassini’s design is also the only composite rotor available with a drum in hat layout that allows the inner ridge of the brake hat to serve as the friction surface for the emergency brake. More importantly, Rassini’s two piece cast iron brake rotor offers incredible heat dissipation through the increased air flow of the two piece design while also weighing less than a traditional one piece cast iron brake rotor. The air flowing between the two pieces of the unique rotor design allows the Stingray to stay cooler while stopping hard over and over without the loss of braking capacity that occurs when the rotors get very hot. Also, the new two piece iron rotors weight about 18% less than a traditional cast rotor design. Less weight in the braking system means that they eat up less horsepower which means more power is being put to the road – all without compromising supreme high speed braking. Finally, this two piece cast iron design is 30% less expensive than an aluminum composite brake rotor so the new Rassini rotors offer a great many advantages over a standard iron rotor while offering comparable performance to far more expensive units made of high tech composites. The new Rassini brake rotors are available specifically on the 2014 Chevrolet Corvette Stingray Coupe fitted with high performance Z51 handling package. The front rotors measure 345mm (13.58 inches) by 30mm while the rear rotors measure 339mm (13.34 inches) by 26mm with a drum in hat size of 200.9mm. Clamping down on these rotors is a set of large high performance calipers with 4 rotors aiding in the stopping up front. All of that rotor size will allow for a ton of brake pad stopping surface so in addition to having great cooling features and a lightweight construction – these rotors should allow the C7 Stingray to stop on a dime. Those 2014 Chevrolet Corvette Stingray Coupes not equipped with the Z51 package are equipped with more traditional one piece cast iron rotors but considering the upgrades in performance and just how awesome the Z51 package looks – we cannot think of any good reason why any C7 Stingray buyers wouldn’t opt for this supreme handling and braking package. Check out our gallery of the 2014 Chevrolet Corvette Stingray Coupe at the Detroit debut by clicking any of the thumbnails on this page for a closer look at the new Z51 package.